First-year students at Service Camp volunteered during the day and bonded over campfires in the evening at Camp Lazarus in Delaware. 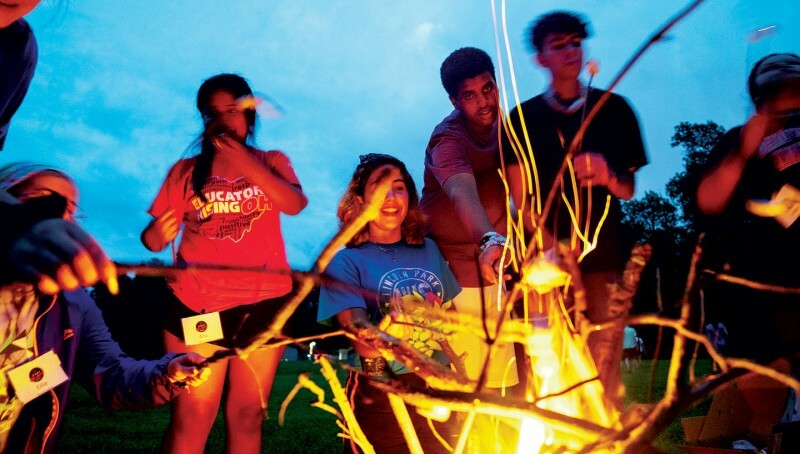 In an effort to provide early opportunities for connection and friendship, the six-day Camp Oh-Wooo orientation experience was universal for all incoming students for the 2018-19 school year. First-year and transfer students arrived for move-in day Aug. 16, participated in Convocation with their families, then set out for camp the following morning. OWU offered four unique experiences. All four camps had a unifying curriculum with discussions and prompts for students to share with one another in small groups, focusing on building community through recognizing that others might be struggling with similar questions or challenges as they enter college. “There were three main focuses to the camps: to create a sense of belonging early on, to strengthen students’ self-efficacy, and to ease their social integration to campus,” says Brad Pulcini, associate dean for student engagement, who helped conceptualize the camps. Challenge Camp at Camp NuHop, about an hour north of campus; students participated in high and low rope courses and canoeing, competed between groups, and worked to support group members as they pushed themselves to meet their goals. City Camp participants remained near campus, allowing fall athletes who had early season practice to participate. Their experience included trips to COSI, Columbus Zoo and Aquarium, the Short North district in Columbus, and the city of Delaware. Service Camp placed an emphasis on volunteering, as students stayed at Camp Lazarus in Delaware and served 30 different sites throughout Columbus, including Ronald McDonald House and the YMCA. Wilderness Camp groups traveled to Coopers Rock State Forest in West Virginia, where they participated in rock climbing, canoeing, caving, and hiking, along with evening campfires. Pulcini says the response from campers was overwhelmingly positive, and the early bonding experience is expected to help improve student retention. “We’re one of the few doing this in this way. What makes us unique is there’s no cost to students and we make it a part of every student’s orientation experience,” Pulcini said. A gift from the Elizabeth Ring Mather and William Gwinn Mather Fund will help support the cost of camp for three years. Planning is already well underway for the next incoming class, and due to the growth and scope of the program, a full-time staff position has been created to oversee the experience.